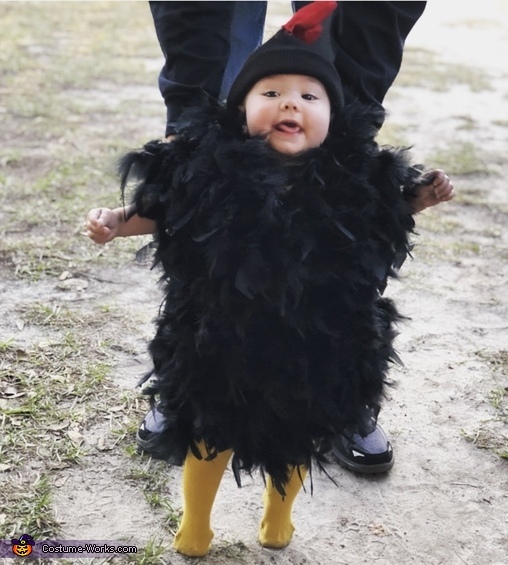 My daughter Brittleigh (11 months) was wearing the costume, we decided to do a chicken because we are HUGE gamecock fans. We decided to do black to be different. We know cocky is garnet. Lol. Everything for her costume except the leggings & stocking cap, were bought at “hobby lobby”. But we used a short sleeve onesie which was $4.99 at hobby lobby. We also bought 3 black feather boas they were $8.99 a piece, from hobby lobby. We also bought safety pins from hobby lobby they were $3.99. Then we bought felt fabric square sheets two of them they were $2.99 a piece, they were also from hobby lobby. The leggings were ordered off of amazon they were $10.99. The stocking cap came from Walmart it was $2.99. (Out of the baby section) we used the black onesie first we wrapped it around the costume and safety pinned it on. Then once that was done we took the felt sheets and cut them into a comb, we took a needle and thread and sewed both of the cut out pieces of felt together and left a little room so we could stuff the comb with cotton balls to make the comb look more real. Then we finished sewing that together and took some of the fabric glue that I had from years ago and glued it on to the hat. The needle, thread, cotton balls, & fabric glue that I’ve had for years ago.